I use the word vacation intentionally seen as that’s the kind of language I’ll be speaking for the next three weeks – I’m off to America! I’m traveling with my friend Liz who is returning to visit her sisters and their new babies. We had been planning a different summer trip before we learned of her impending niece and nephew, so then she invited me to come explore America with her instead. It’s my first time there and I’m going to get to see parts of the country that are off the typical tourist track. We fly into Chicago for a week to visit some aunts and uncles and grandmothers, while also exploring the city. There are so many buildings that I want to see. Then we begins our real travels by driving down to Memphis, Tennessee via St Louis, Missouri. On to Nashville, down to Huntsville, Alabama, back up to Knoxville, Tennessee. Pop over to Ashville, North Carolina before finally heading down to Atlanta, Georgia for our flight back to Tokyo. I’ve set up another blog so that I can put up pictures and short posts during the trip as a kind of scrapbook/diary, so check it out. People love to hear about the crazy side of Japan* – weird inventions, wacky comedy shows, and penchant for dressing up in costume. But the craziness isn`t limited to modern phenomena, some dates back for hundreds or thousands of years. 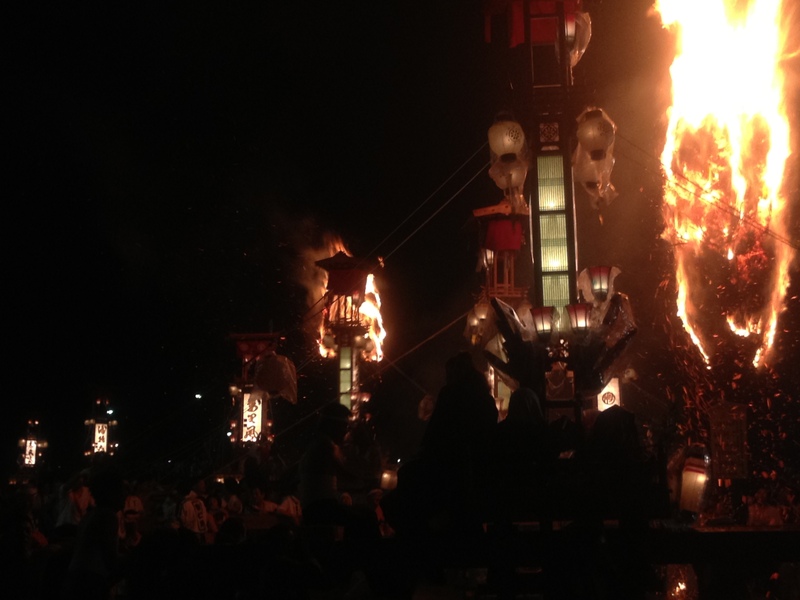 Practically every town in Japan has its own festival, and I`ve written about some big ones I`ve been to like the Hyakumangoku Festival in Kanazawa and the Seihakusai Festival in Nanao. 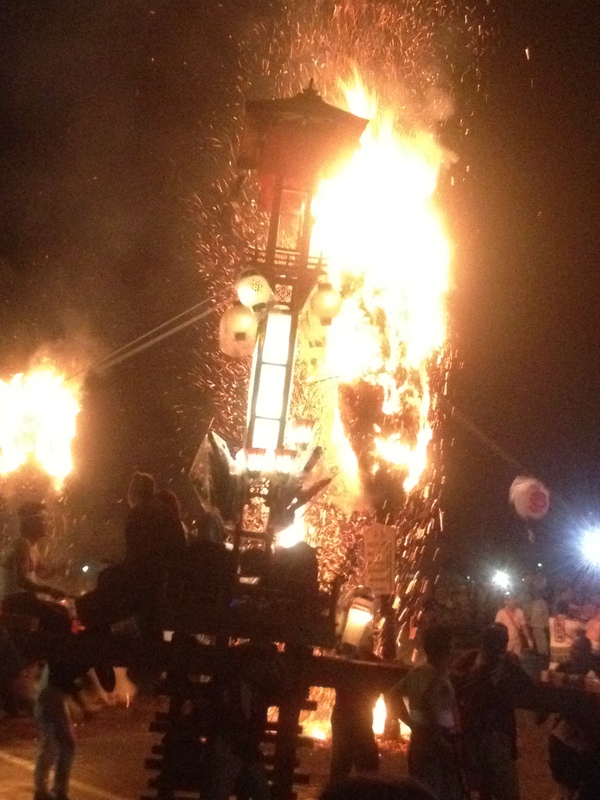 It seems that the smaller and more rural the town, the stranger the festival. 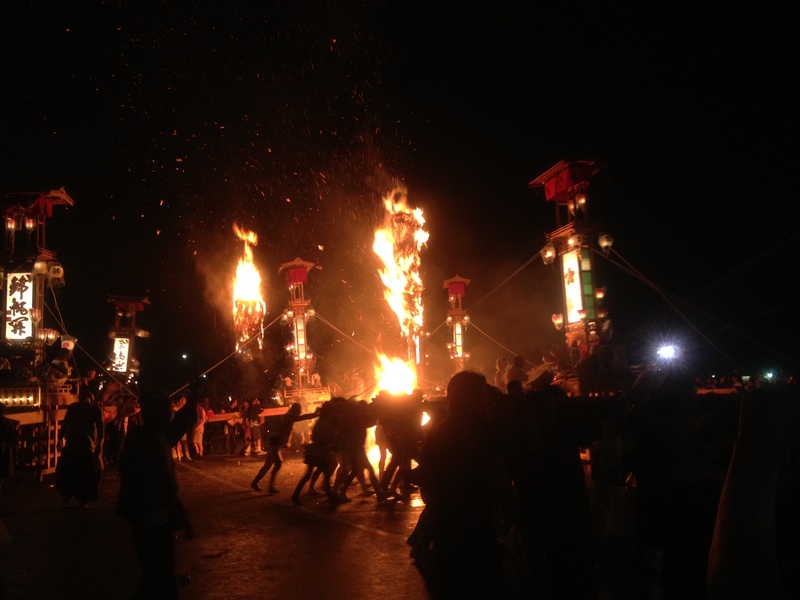 Seihakusai was crazy enough with the gigantic wooden floats carrying children being pulled around the town by drunken men, but it was nothing compared to the Abare Matsuri 暴れ祭り further out on the Noto peninsula. 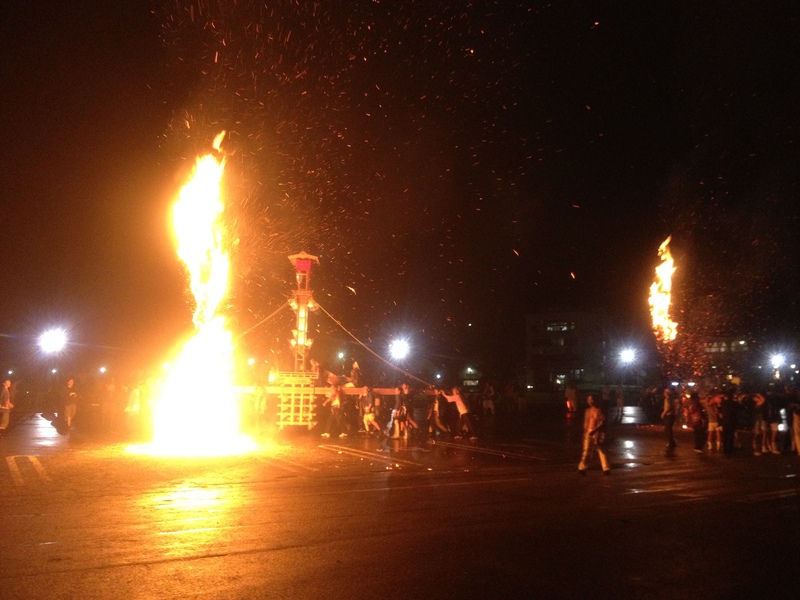 `Abare` means powerful, and it`s been translated into English as the Fire and Violence Festival to better describe what happens during the two-day festival. 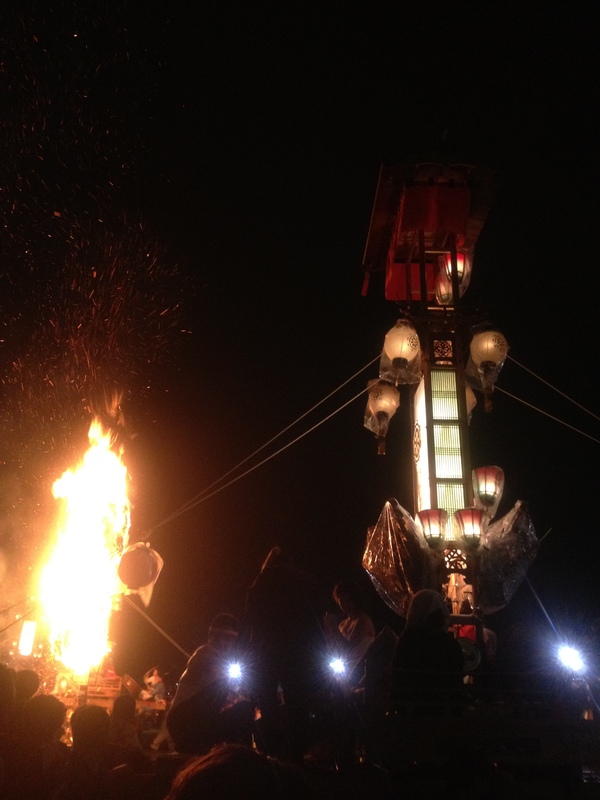 The festival has been going for some 300 years, it originated as a way to try and rid the town of an epidemic and since then has been a way to bring good fortune to the town and display the masculinity of its men. 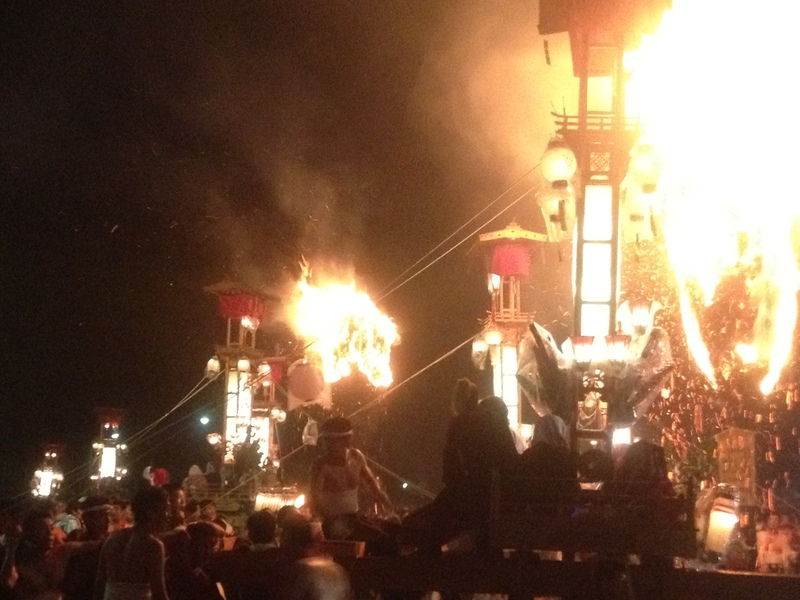 The fire is on the first night and the violence is on the second, although the two do naturally get mixed sometimes. 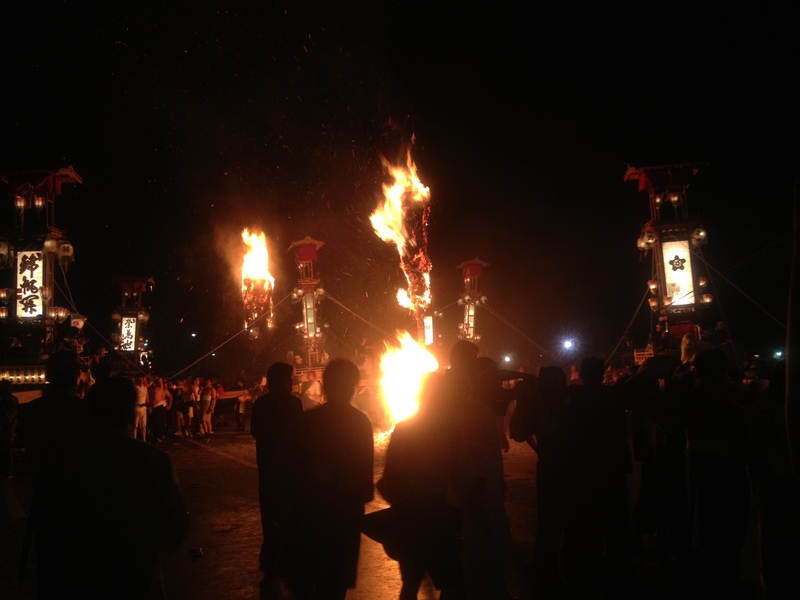 On the first night, huge straw lanterns called kiriko are set alight down by the harbour and portable shrines called mikoshi, on top of which sit children and drummers, are carried by half-naked drunken men around the flaming lanterns. 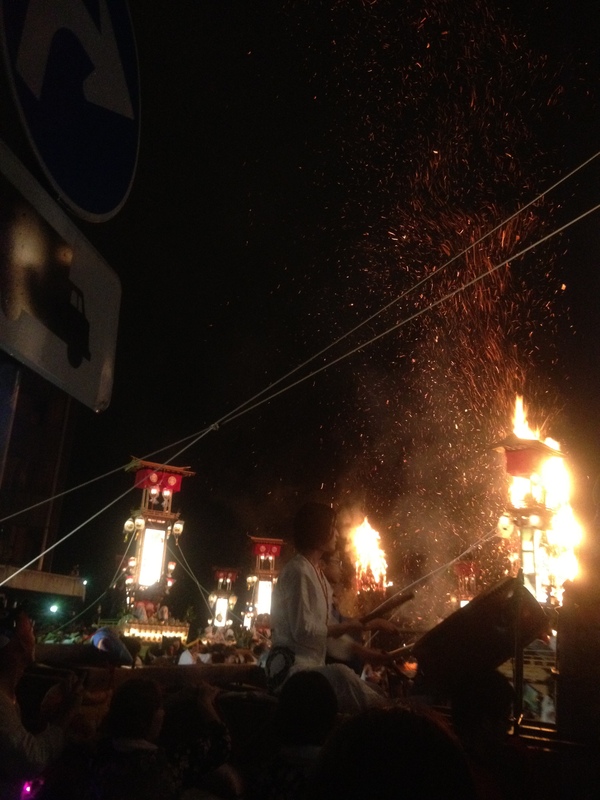 The shrines have to circle the lanterns a certain number of times before they can be taken through the streets. But the space is quite tight and there are so many shrines that it takes quite a while, as sometimes the men will fall or get stuck in a gridlock with the other shrines. 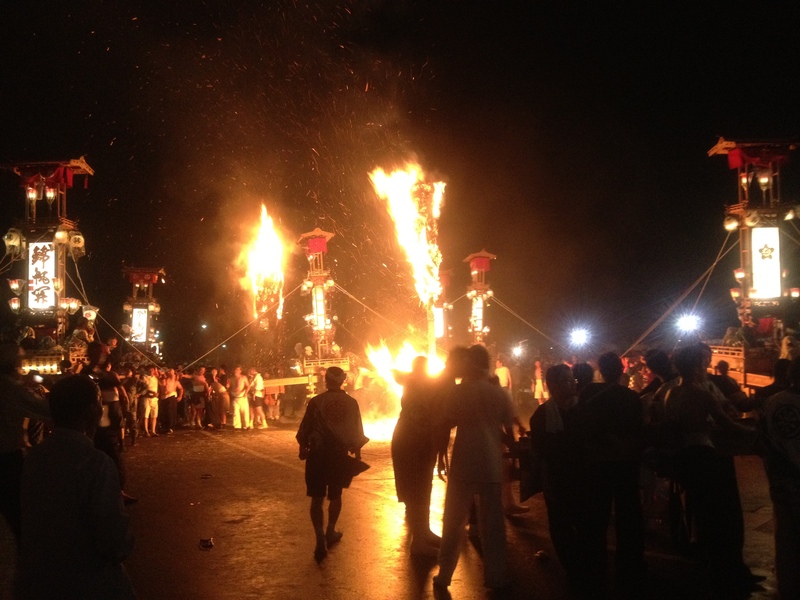 As well as the fact that the lanterns are raining down showers of sparks and ashes on the participants and crowds alike, some of the more pumped-up (drunk) men will run up to the lantern and kick the pole to make some of the burning straw fall. 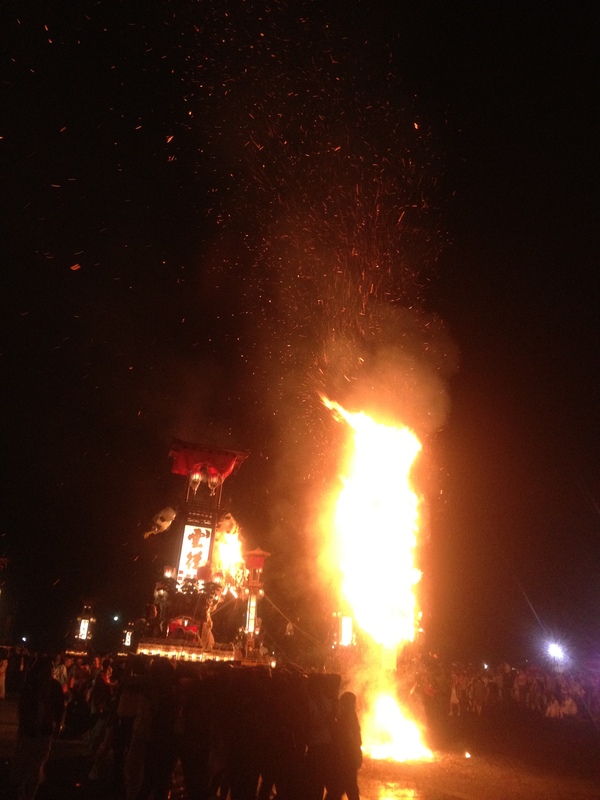 Some men went and danced in the sparks, it`s supposed to be an honour to get a scar from the festival. 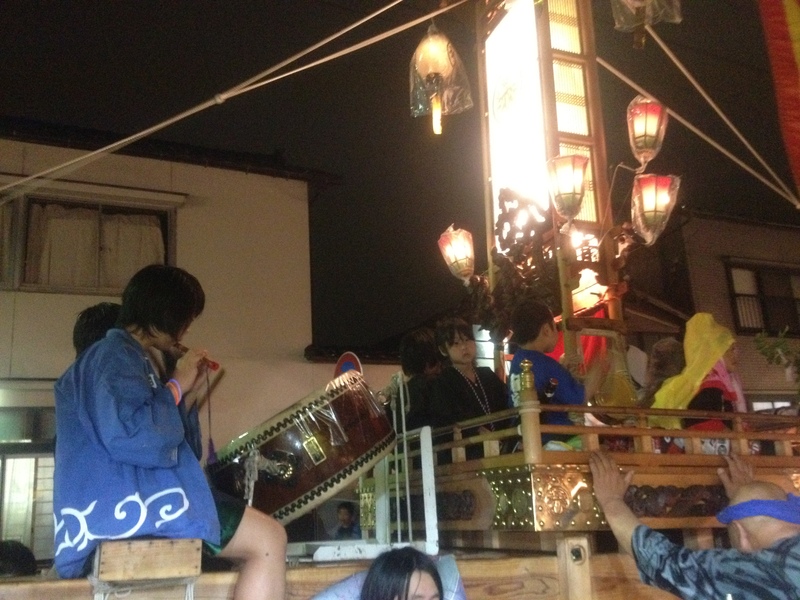 There are no barriers between the audience and the procession, and sometimes you are in danger of getting knocked over by a shrine if it veers suddenly off course. And of course children are in the thick of it. 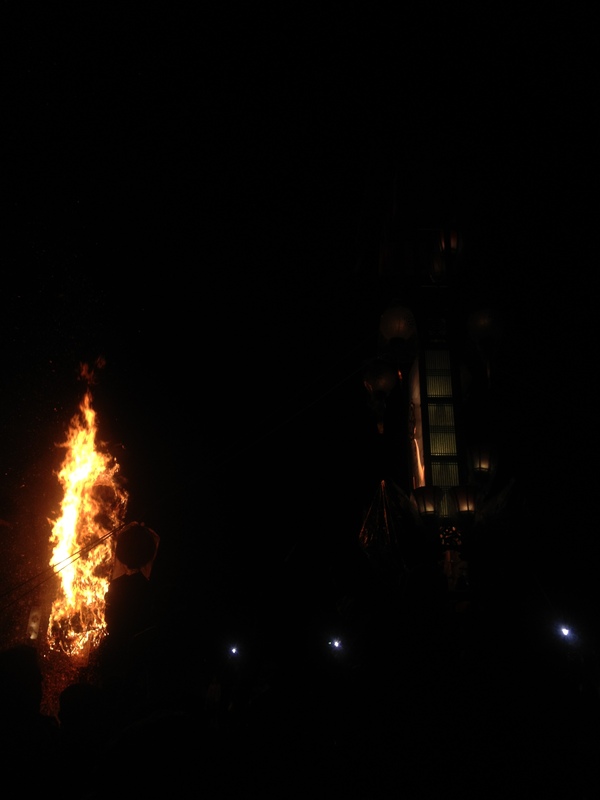 I only went for the Fire part, but next year I want to go back for the Violence, when they carry the shrines through the streets, damaging them as much as they can until they reach the river and throw it in, bashing it around as much as they can. 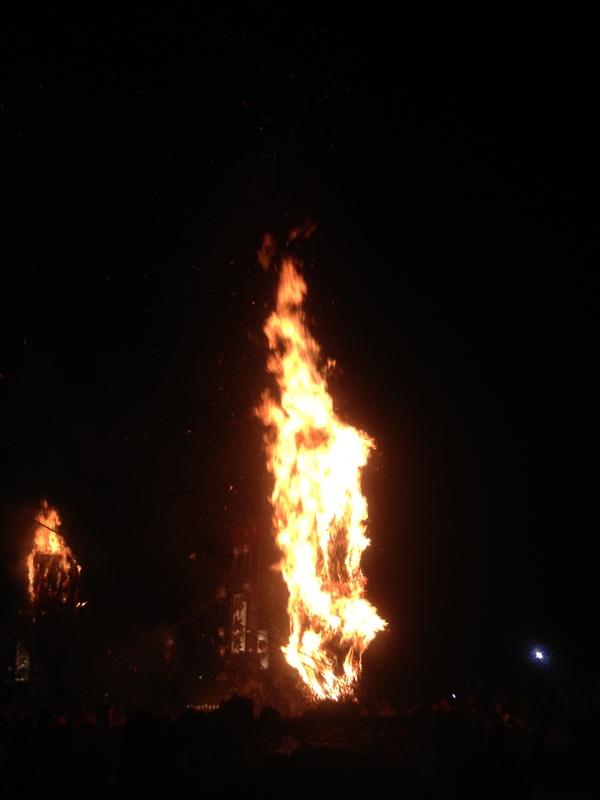 I think they might try and set it alight at some point, but I`m not sure, seen as it would be wet from the river. It is difficult to get to Ushitsu where the festival is held because the train doesn`t go up that far and there are only two buses per day from Kanazawa Station. 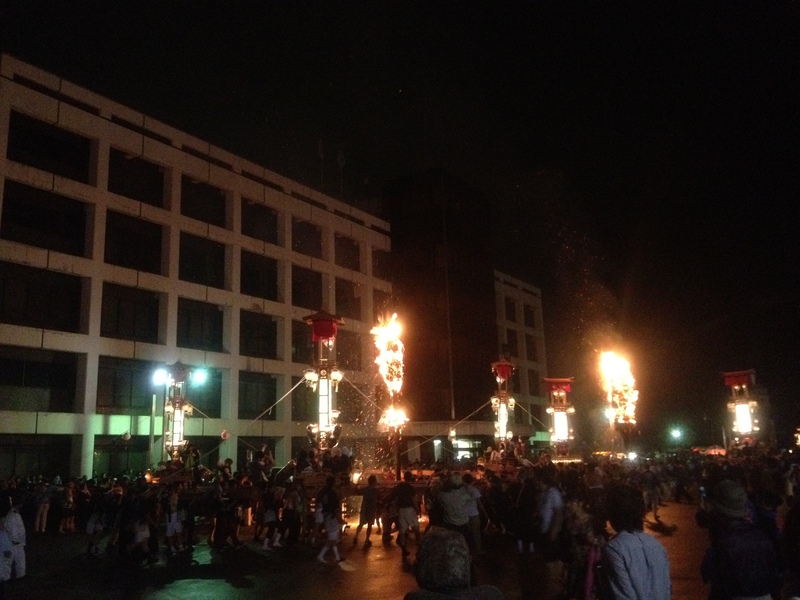 You would need to organise accomodation too because the best part takes place at night and it`s usually raining around the time of the festival. Luckily when we were there the rain held off for the most part during the festival, we got a lift from Anamizu Station and were able to stay with a friend who lived near Ushitsu. Unfortunately when we went to the festival I forgot my camera, but I was able to take some photographs with my phone which didn`t come out to bad.